Here you’ll find answers to some of our most common questions about giving with Second Ebenezer. What does “cover card processing fees” mean? This option allows you to cover the cost of your processing fee to the church. This ensures that the ministry gets the full amount that you intend. How do I give by text? Text your amount to 313.732.9369. 3) Enter your amount and card information. *To set up re-occurring giving, select the “Setup automated giving” button. When you go to give for the first time, simply click “Sign Up” in the upper right-hand corner. Next, enter your information followed by creating a password a custom pin number (for quick access to your account later). Why am I being asked to create a pin? This number allows you to quickly access your e-Giving account in the future giving without having to re-enter your account password. In some cases, it may be used to verify your identity and prevent fraud. Just like with your password, keep your pin number secure. How do I give via the app? Search “Second Ebenezer Church” from your Google Play or App Store. Download the app and click “Give“. Search and download the “Tithely” from your Google Play or App Store. If you’ve registered before, sign in with your current email address and password. 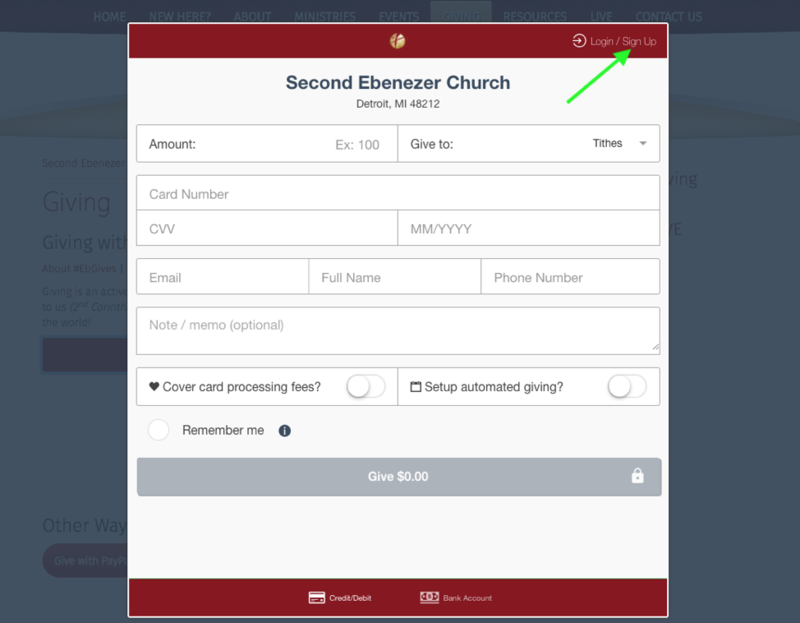 If this is your first time registering, select Register and then search for “Second Ebenezer Church“.